Rather than the flashing and all action dance floor lighting found on subsequent pages, this type of lighting can be used to completely change the look and feel of the room or the space your event is being held in. Located sensitively our uplighting fixtures can be used to enhance and highlight architectural features that may otherwise be overlooked. These really can make a relatively modest venue into something truly magical. Normally set to a static colour (although most can be set to fade gently between colours or even double up as dancefloor lighting), colours can be selected to match your specific theme, or to contrast to it from a virtually unlimited colour palette. This package can paint the walls and ceilings of a small room or hall with light in the shade of your choice, transforming even the dowdiest of venues to something truly magical. We are happy to advise on the number of cans required dependent on the style of lighting required and the size of the venue. Requires 1 x 13 amp socket. 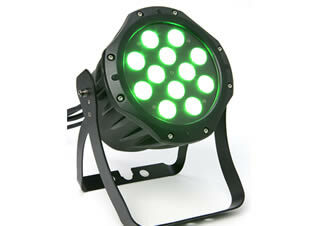 Each additional LED Par56 can, for larger venues. 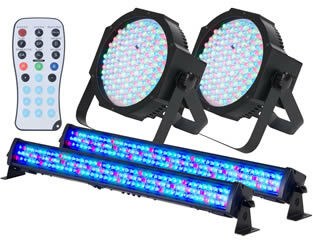 For a superior look due to enhanced colour mixing, this package is also slightly quicker and neater to set up in a smart venue due to the smaller low profile fixtures used and to not needing to run data cables to set colours (see fuller details in the fixture listing below). 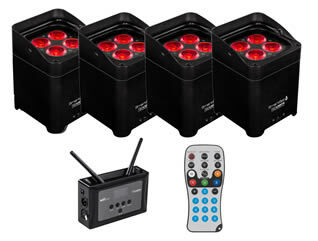 The lights can also be set remotely using the included wireless remote control. Requires 1 x 13 amp socket. 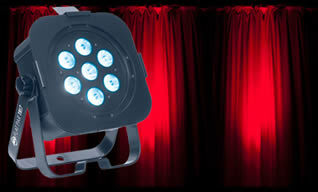 Each additional Mega Tri-par fixture, for larger venues. Per fixture in lieu of Tri-par profiles. For easy and quick setup and the ability to place lights in locations where power supply is limited or even non-existent, this package is the ideal solution. The fixtures are battery powered and can be set to the desired colour by the included wireless remote control, making it possible to create a stunning room lightscape in a matter of minutes. The batteries are also powerful enough to run for 8 hours (on full charge at full white) giving plenty of time for a normal event. Requires no sockets. 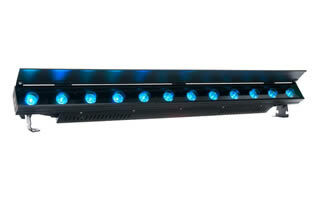 Each additional Mega Go Bar or Par fixture, for larger venues. For those seeking the best in uplighting, this package is by far the most convenient and flexible of all. The compact fixtures are both battery powered and wi-fi controllable enabling them to be positioned wherever is convenient within your venue and then simply adjusted afterwards, even during mid-event. They offer both bright rich colours as well as soft pastels due to the white LED – the colour mixing is exceptional. They also have an extraordinarily long battery life of up to 12 hours, enough to last even the longest of full day events or even two nights without the need to recharge. We can also supply optional chrome shrouds to encase the lights for the smartest functions. The standard package is supplied with a wireless remote control so the fixtures can be controlled individually, but if you require full control of the lights as a single entity or in groups, you need to add the optional wi-fi distribution unit, controllable via a smart phone, tablet or laptop using a freely downloadable iOS or Android app, or via a compact lighting controller. 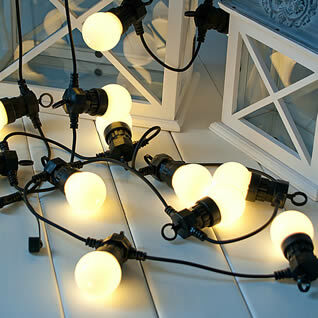 We also have exterior rated versions of the same fixture which will seamlessly mix with these. See below. Each additional SmartBat Quad fixture, for larger venues. 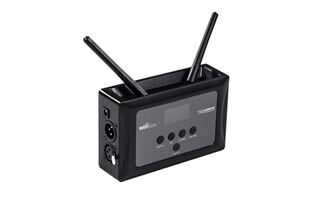 WiFi Box / DMX interface, enables the lights to be remotely controlled en masse or in selected groups via a tablet or smart phone (free Smartcolors app download required) or cabled via controller. 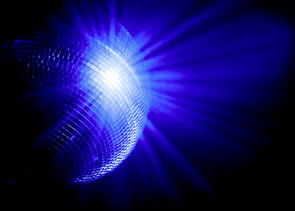 Suitable for uplighting to colour-paint walls or ceilings or to light stage areas and dance floors. They can be used on their own, set to a fixed colour, operated in sound to light mode or fully controllable with a dedicated controller. 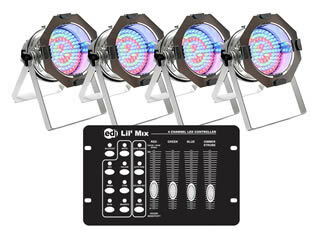 Supplied with linking power lead and DMX control cable. Best utilised in multiples of 4 or more. We are happy to advise on the most suitable number. A more discreet fixture than traditional parcans which is both brighter and gives you richer colours with a smoother colour mix. 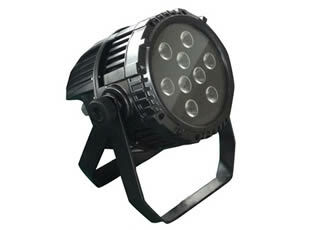 It utilises five 3watt tri LEDS to output really excellent user selectable shades, ideal for great uplighting results. 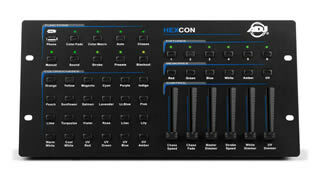 They feature full DMX control and master and slave settings in Sound to Light mode as well as built in programmes. They can also be controlled by an optional wireless remote control (only one required for any number of fixtures). If you need something with a bit more light output than the Mega Tri-par above but with the same great colour mixing, then the Flat Par Tri 7 is the fixture you need. Still in a relatively modest enclosure, these lights sport 7 x 3 watt tri LEDS capable of illuminating larger rooms with higher ceilings or darker wall coverings. Again they can be controlled by an optional remote and can be mixed and matched with the Tripars if necessary as they have the same colour engine. 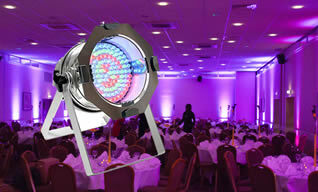 For the ultimate in simplicity and speed of set up, these half metre or circular par 64 fixtures take a lot of beating. They are battery powered so they can be simply positioned wherever you want them - on sills, against pillars in the centre of the room or even in the most remote areas – in fact in any places where a conventionally powered lights would be difficult or impossible. They also work with a wireless remote control (optional) so you can select colours with a few presses. They also feature full DMX control, master & slave (both only when cabled), sound to light and inbuilt programmes making them a hugely versatile light. A 1 metre bar which is perfect for wall wash lighting. It is fully DMX controllable but it’s in built programmes can also be accessed by the wireless remote control supplied with each rental allowing easy access to all the in-built colours. 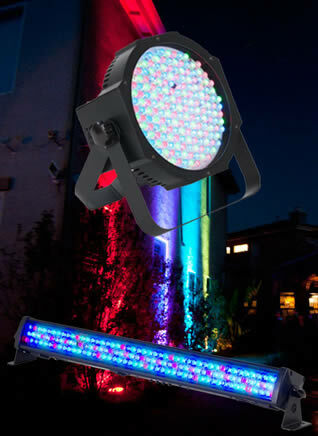 A portable battery-powered LED fixture designed specifically as an uplighter for all kind of events. SMARTBAT is equipped with a lithium battery pack and a built-in WiFi module for cable-free operation. The ultra-compact and lightweight design makes it truly portable. The internal battery will comfortably run for 12 hours on a single charge. The light source is composed of 4 x 8W high-power RGBW LEDs and has an extractable foot allowing you to adjust the angle of the beam. It is controllable via a wireless remote control as well as by DMX signal via WiFi technology. The optional WIFIBOX is compatible with any DMX controller or through the free app SMARTCOLORS, which runs on any iOS or Android smartphone or tablet. WIFIBOX / DMX interface, enables the lights to be remotely controlled en masse or in selected groups via a tablet or smart phone (free Smartcolors app download required) or cabled via controller. 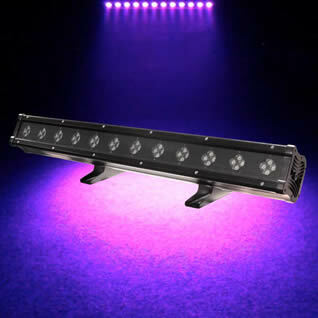 An LED linear fixture with a 40° beam angle but with the versatility of having 12 x 10w Hex LEDs giving a significantly enhanced colour gamut including ambers, warm and cool whites and striking UV enhanced colours. Excellent dimming capabilities including 5 selectable curves and full pixel control of each LED via DMX makes this a superb uplighting tool. Also controllable to a lesser extent via optional remote. An easy to use controller for the above fixtures which allows one touch colour selection buttons, the ability to spectrum mix any colour combination, dimming and chases. If you are looking to light up the façade of a building, illuminate architectural features such as statues, fountains, or highlight trees or shrubs in gardens or parklands, the fixtures below are ideal. Due to their IP65 rating, these are totally waterproof and can be left outside whatever the weather conditions for a prolonged period. 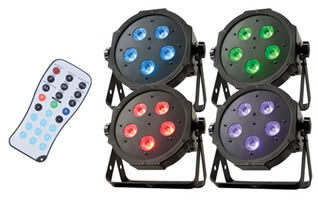 They can be set to the desired colour via on-board control or DMX. Previously only really possible by experienced lighting engineers, due to these battery powered fixtures, it makes illuminating buildings, gardens and ornaments a snap! 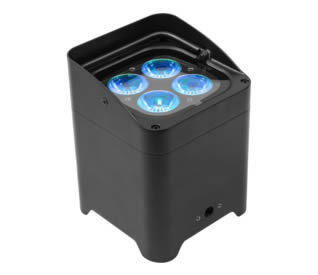 The supplied 4 fixtures have a battery life of up to 6 hours, ideal for an evening function, what ever the weather and can be quickly recharged. Requires no sockets. Please note this is not an IP rated item so must be positioned under cover. It will, however, transmit successfully through regular windows and doors with minimal disruption to signal. Using the same fixtures as in the Prestige Interior Mood lighting package but with IP65 rated fixtures sealed to keep out the weather, they offer the same fantastic feature set including wireless connectivity and long battery life. 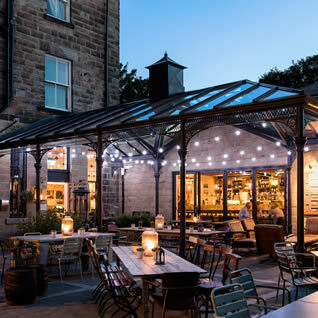 They are totally compatible with the interior versions of these fixtures and can be used seamlessly with them, enabling you to run a lighting scheme from the inside of the venue to the exterior without fear of what the British weather may do! Each additional SmartBatIP fixture, for larger venues. A fixture sporting 12 x 3watt tri-LED, this fixture is compact and easy to site due to its’ integral stand/hanging bracket. It’s bright output has considerable throw and can light sides of buildings and trees with relative ease. 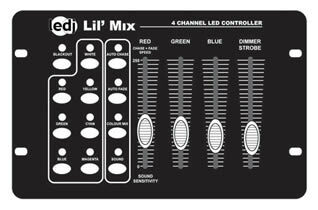 It is fully DMX controllable but for simplicity you can also set your colour mix via the control panel on the back of the fixture, saving additional cabling. Supplied with 5m waterproof extension cable and mains plug. 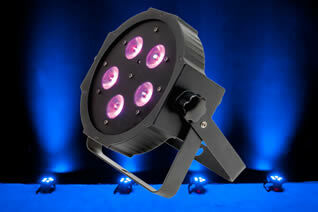 This quad LED powered fixture comes in a rugged aluminium body and is really bright thanks to it’s 9 x 10w diodes. It’s internal battery which has a life of between 5 and 6 hours makes it possible to position almost anywhere with ease. 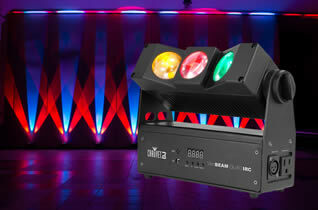 It also sports a wireless DMX receiver making setting colours a breeze, even at a distance of up to 500ft. 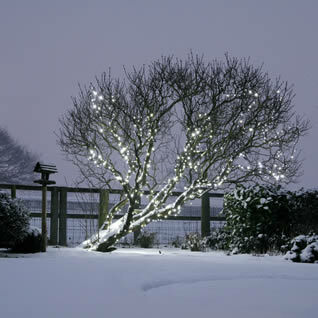 This makes it the easiest solution for excellent exterior lighting. This light shares the same features as the interior version as listed above, but has been weather sealed making them usable outside in any weather conditions. They are totally compatible with the interior version in every other way and may be mixed and matched accordingly. 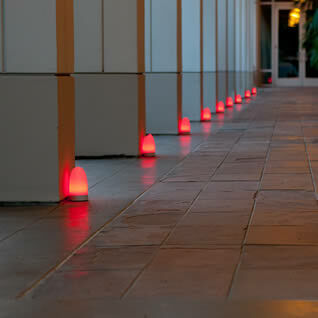 An ideal fixture to illuminate building facades or architectural features. 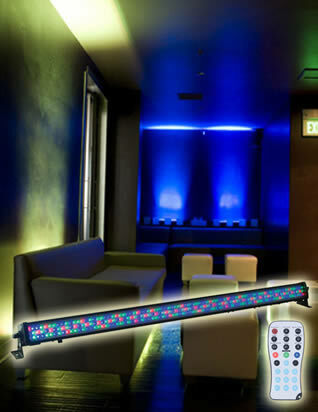 These 1m bars contain 48 3w RGBW LEDs giving really high power along with a virtually limitless colour palette, which can be set on-board each fixture in master and slave or via DMX. Due to their IP65 rating, these are totally waterproof and can be left outside whatever the weather conditions for a prolonged period. 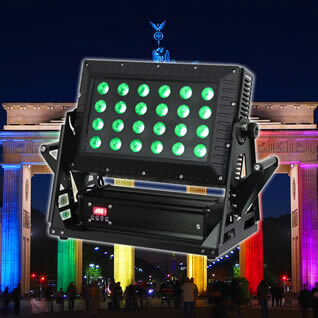 A high output, tri-colour architectural fixture suitable for events. 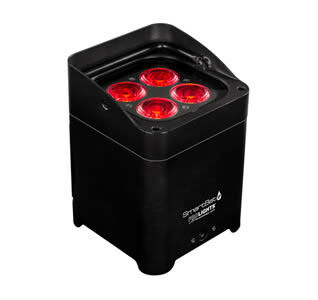 Housing 24 x 9W tri-colour LEDs (RGB) it is ideal for lighting large buildings, structures and gardens with a 45° beam angle. The immense colour palette can transform environments using the fixture’s incredible long throw capability. It can be controlled by on board settings or via DMX. Less full on than the mood lighting above, decorative lighting can add the finishing touches to your event, whether it be a wedding, a special party or even a summer barbecue. These are high quality, waterproof lights, (not the cheap and cheerful Christmas types sold in DIY stores) and are ideal for wrapping around pillars in halls or barns or for decorating buildings, marquees, fences, pergolas or trees, hedges and shrubs. They can also be joined using connectors to create canopy effects. Perfect for weddings, garden parties and special occasions to add a magical air to proceedings. 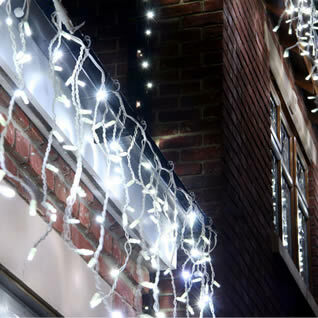 They are supplied in 10m lengths containing 100 lights in white or warm white – additional lengths can be joined together to create strings up to 100m. (We also have extension cables and T pieces for this if required). Initial curtain (includes transformer and mains connection with approximately 2m of cable). These are commercial grade fixtures measuring 2m x 2m and containing 140 LEDs, available either in warm or cool white. 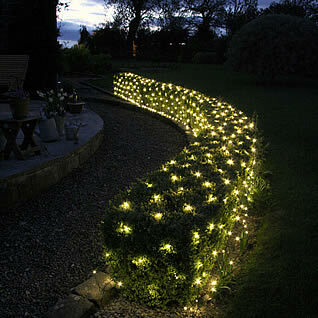 They are ideal for decorating hedges, bushes or walls, transforming them into something special. Up to 4 cool white or 5 warm white nets can be joined for larger coverage. Initial net (includes transformer and mains connection with approximately 2m of cable). 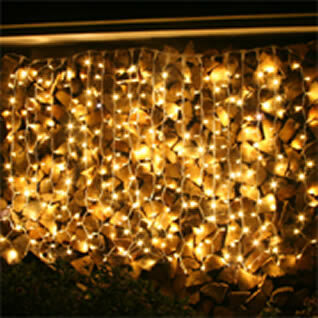 Professional grade outdoor icicle lights on white rubber cable with 100 white LEDs. 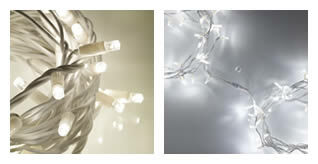 With cold icy white tones, these LEDs give a modern feel to any display. Each string is 2 metres in width and has a male and female connector which allows you to connect up to 40 sets in one continuous string. Initial length (includes transformer and mains connection). Fully waterproof globes in warm white, similar to the old fashioned festoons to create a nostalgic look, but using modern energy efficient LED technology. 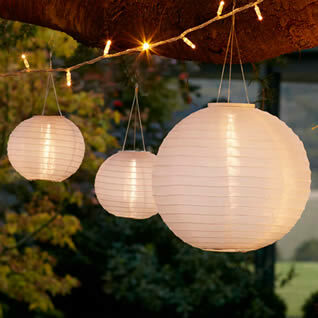 Hang them above your patio, in your gazebo or conservatory and you've got instant lighting for your party. They are also great for lighting paths. They come in linkable 5m sections in two different styles. 5m strands with 20 lamps and supplied with loops above each lamp so they can easily be suspended from wires, ropes, hooks, etc. Up to 6 strands (30m) can be run off one low voltage transformer. These are best suited for relatively small areas, but can be used with multiple plugs for larger installations or small amounts in multiple locations. 5m strands with 10 lamps. These lamps are brighter than the 20 lamp strands above. Up to 30 strands (150m) can be run off one mains plug. 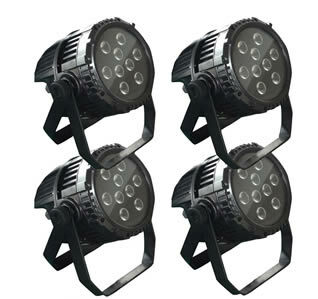 These are best suited for relatively larger areas where finding multiple power sources might prove challenging or the appearance needs to be a little less intense. Various length extensions and cable splitters are available for these lamps. This feather light white lantern stylishly sits in your trees or from fairy or festoon light strands gathering solar power during the daytime and then warm white LEDs radiate an ambient glow come evening. Made from durable nylon, they’re ideal for summer use and can be left outside, even in less than ideal weather. As these require at least a full day’s charge to get maximum use from them, we are happy to extend all rentals by a day to allow for charging in situ. 6-8 hours of light can be expected after a full sunny day of charge. They come in two sizes. Located suitably around a venue, grounds or even as table centrepieces these colour decorations add an unusual and fascinating accent to any party or event. The lights can be set to one of 8 colours via the included wireless remote control or can fade between a range of different colours in 3 selectable speeds. 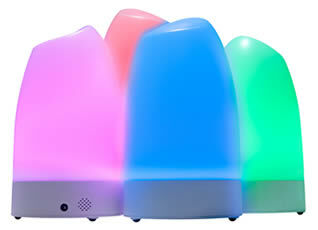 They come in sets of 4 rechargeable lights which have a battery life of up to 5 hours. They can either be linked or run standalone and further sets can also be added and run from the same controller.